The characterization of Edgar Allan Poe in “The Black Cat,” while incorporating a handful of true details (his wife’s consumption, for instance), is certainly highly fictionalized to suit the needs of the story. 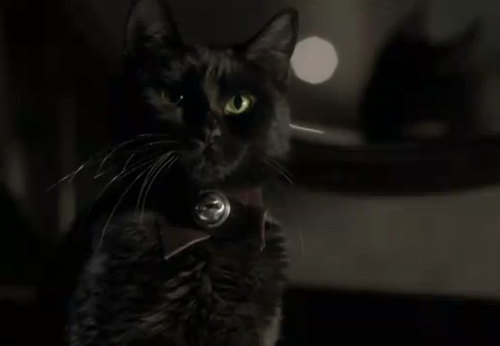 There are also a few elements that clearly send up to Paoli and Gordon’s previous work, most notably the eponymous black cat itself. “Re-Animator,” their most famous collaboration, features a notable segment with a zombie cat puppet who attacks Jeffrey Combs (who plays Poe here), which seems to be lampooned throughout this adaptation of “The Black Cat,” something that I definitely appreciated. The cast is led by long-time Stuart Gordon contributor Jeffrey Combs, who plays the famed author and poet Edgar Allan Poe. He would later take up playing Poe on stage as well, in the one-man play “Nevermore…An Evening With Edgar Allan Poe” which saw wide acclaim, running in 2009 and 2010. 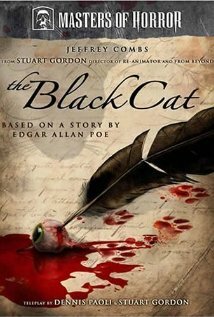 The story of “The Black Cat” follows Edgar Allan Poe as he deals with his alcoholism, writer’s block, and the slow disintegration of his wife’s health. As everything around him begins to fall apart, he begins to believe that his wife’s black cat has cursed them, and is the source of their troubles. He then takes a series of increasingly drastic actions. 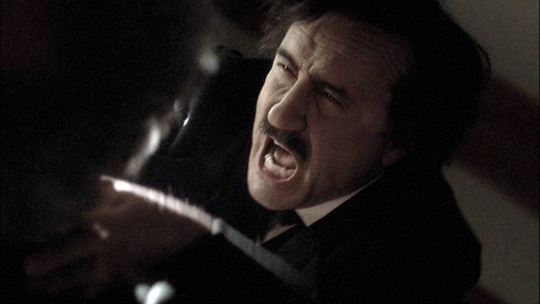 Personally, I thought Jeffrey Combs was pretty fantastic playing E. A. Poe. However, the writing on this is far from ideal: it tries to meld aspects of both Poe’s personal life and the original short story of “The Black Cat,” and the result is just a tad strange for those familiar with the sources. The whole film of “The Black Cat” has a greyed, desaturated look to it that I am sure was meant to give it a dark, aged appearance. It did help to make the blood stand out, but I thought it was a little bit overdone, and that it should have been toned down a little bit. It ultimately served to mute all of the details, which didn’t do the movie any favors. I really like a lot of the shots, but the whole thing doesn’t come together quite as well as I had hoped. In comparison to “Dreams In The Witch House,” Stuart Gordon’s other contribution to “Masters of Horror,” this doesn’t feel like as complete of a work. Even though Jeffrey Combs is fantastic in the lead role, he isn’t able to cover for the weaknesses of the story. I actually think that this is a rare case where the original source material would have been better off with less alterations. This would have meant that Poe himself wouldn’t be included, but I think that the faux-biopic aspect of the film is part of what muddies it so much, and causes it to lose focus. 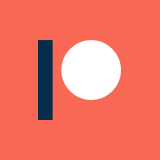 Having Poe as a book-ending mechanism might have worked out, but I think taking Occam’s razor to the script would have been the best method to correct the issues with the story. I still like “The Black Cat” as a film. It has some really enjoyable moments, mostly powered by Combs, and it is certainly better than what you would typically find in television horror. It also well represents Stuart Gordon’s style, more so than most of his more recent work, which is really fun to see. As far as recommendations go, despite my criticisms, this gets pretty solid approval from me for entertainment value. It certainly could have been executed better, but the ultimate result is certainly entertaining, and that isn’t a result to be argued with.